Combat sports are dangerous, aggressive, and entirely unpredictable. Unlike other sports where you can forecast certain plays and an outcome, these one-on-one physical competitions can usually go either way. Because of this, combat sports like boxing and MMA are thrilling for fans across the world. Those who partake in the sport must keep their bodies in peak physical condition. Whether they’re using their strength to make a strike at their opponent or showing off their agility by dodging blows, the skills of the players are always apparent. While all combat fighters are impressive, a select few memorable players have staked their claim in history. These fighters are known for their unique style, unbreakable confidence, and out-of-this-world skills. Here are 9 famous fighters that dominate combat sports. Muhammad Ali became a household name during his career, being known even by those who didn’t follow the sport. 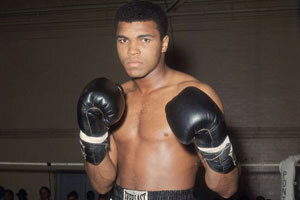 Hailing from Louisville, Kentucky, Ali rose through the ranks of boxing to become the greatest heavyweight in history. He won the world champion title in 1964, 1974, and 1978. During his career, he only lost 5 fights. This is a testament to his tenacity and skill. This Russian mixed martial arts fighter has accomplished great feats in his relatively short career. That being said, he continues to fight in the ring, using his bevy of skills to his advantage. He started his MMA career in 2000, showing his fighting prowess by winning four straight matches. Since then, he’s earned numerous awards and titles. Despite a short hiatus, Fedor Emelianenko continues to compete. Emelianenko is known for being aggressive in the ring. Commonly called a striker, he’s vicious when he finds an opening. 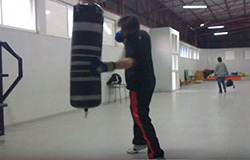 That paired with clever footwork make him a force to be reckoned with in the ring. While many of his maneuvers are considered dangerous, most of them are successful and memorable among fans. Sugar Ray Robinson rightfully earned his place in the International Boxing Hall of Fame. He’s often considered to be the best boxer in history. His relatively small stature and middleweight class make him a unique fighter. While most wouldn’t consider him a huge threat based on his looks, Robinson was a fierce competitor. Not only that, but he was versatile. Instead of sticking to one style, Robinson was known for being able to adapt to numerous styles based on his opponent. Despite his size, this fighter was fast and efficient. He participated in 200 matches throughout his career and won 173 of them. He won numerous championships and titles in welterweight and middleweight classes. This French-Canadian mixed martial arts fighter is one of the best the sport has to offer. He’s a welterweight fighter and has won the UFC welterweight championship three times. Throughout his career thus far, the fighter has only lost 2 out of 27 matches. With only 11 years in the ring, he’s currently taking time off from the sport, though fans across the world are anxiously waiting for his return. In the ring, Georges St-Pierre is known for his powerful strikes and grappling abilities. When met with an opening, the fighter can use his power to take down even the toughest opponents. Despite his ferocity in the ring, this intimidating fighter is known for his calm and quiet demeanor outside of the sport. One of the most successful and notorious fighters in the world of boxing, Mike Tyson is known for his action in and out of the ring. As a fighter, this heavyweight has won numerous championships and titles. In fact, he is the former undisputed heavyweight champion and is the youngest boxer to win a collection of titles, even to this day. 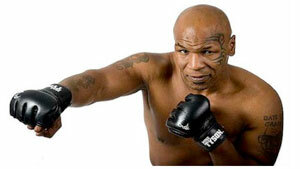 In the ring, Tyson was unforgiving and relentless. His pure striking power could easily take out any opponent while his reflexes helped him navigate the ring and avoid his opponent. Memorable fights against Lennox Lewis and the infamous biting incident that occurred against Holyfield have made him known by spectators all over the world. Coming from the Philippines, Manny Pacquiao has made a splash in modern professional boxing. He’s often considered one of the best due to his numerous titles. Some of his accomplishments include ten world titles and becoming an eight-division champion. Pacquiao was named “Fighter of the Decade” for the 2000s by numerous associations. To many fans and professional athletes, Pacquiao has reinvented boxing and defines the current generation of professional fighters. This is because of his unique style and approach. He uses incredible footwork and angles to make his strikes. Hyped matches and televised events have made him one of the most recognized modern fighters. “The Brockton Blockbuster” had an illustrious career that deserves to be remembered. His boxing career is the stuff of legend. He held the world heavyweight title from 1952 to 1956 and went undefeated throughout his entire career. He defended this title 6 times. He fought 49 matches and won every single one. He has an impressive knockout rate of 87.75, which is still one of the highest in history. Rocky Marciano had little training in the sport before becoming a professional. However, this lack of training was made up for by sheer force and power. He swarmed his opponents while still retaining his stamina, allowing him to go strong through the match. While known by many for his films and celebrity status, Bruce Lee was an avid competitor known for his unique style. In fact, Lee created his own martial arts style, Jun Fan Gung Fu, that became popular after fans witnessed it in his films. The fighter was famous for not just his martial arts, but his physical prowess and fitness. Bruce Lee began teaching his own style of martial arts, despite his dominance in numerous other styles. This style of fighting was known for its speed and efficiency. He had a number of memorable moves. His one-inch punch delivered incredible power while his two finger pushups showcased his control and fitness. This Brazilian mixed martial arts fighter has a number of impressive titles. He held the longest title streak in UFC history and won the UFC middleweight championship in 2006. He’s considered by many, including the UFC president, to be among the greatest UFC fighters of all time. When it comes to fighting style, Anderson Silva is well rounded and accomplished in many areas. That being said, he’s most known for his striking ability. He has incredible accuracy and power. He’s also an impressive grappler, despite having more success in his stand-up game. Despite almost two decades of fighting, Anderson Silva continues to dominate the ring today.